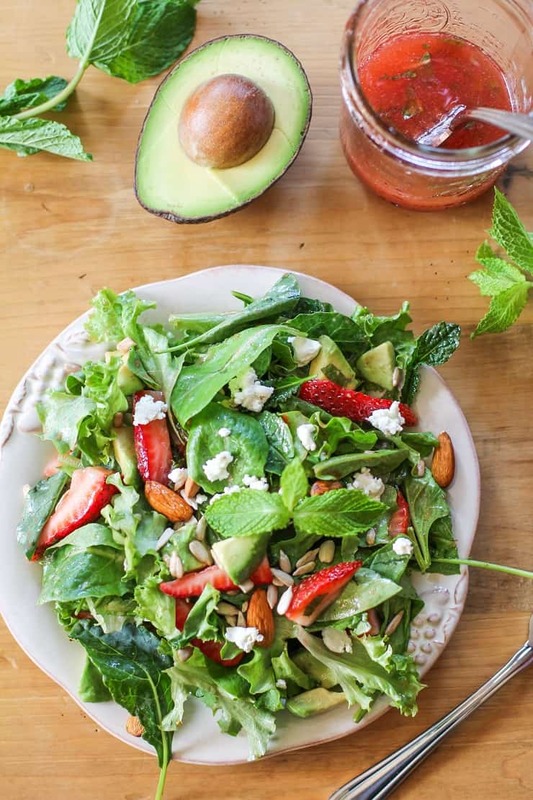 Baby kale salad with strawberry-mint vinaigrette, avocado, goat cheese, and almonds. This vibrant, healthy salad is perfect for summer. Ever since I turned in my manuscript for Let Them Eat Kale! , I…well…I haven’t eaten kale. Not because I lost that loving feeling toward the leafy green, but because my kale tank was full and it hasn’t been until recently that I felt I needed to replenish it. So this weekend, I did a little house, dog, and cat-sitting, a little wine-ing (shocked? ), and a lot of kale-ing. I had strawberries that were ripe for the using and some fresh herbs, so I decided to make a strawberry-mint vinaigrette for the kale salad. The vinaigrette turned out sweet, tangy, and refreshing. I used baby kale leaves because they require less prep than your standard curly kale. And I was busy wine-ing so I couldn’t be bothered to stop and massage the kale. No way, no how. Solution: baby kale. I threw sunflower seeds, almonds, avocado, fresh chopped mint, and goat cheese into the mix and ended up with a flavorful, healthful, vibrant, spring salad. Ripe for the eating! 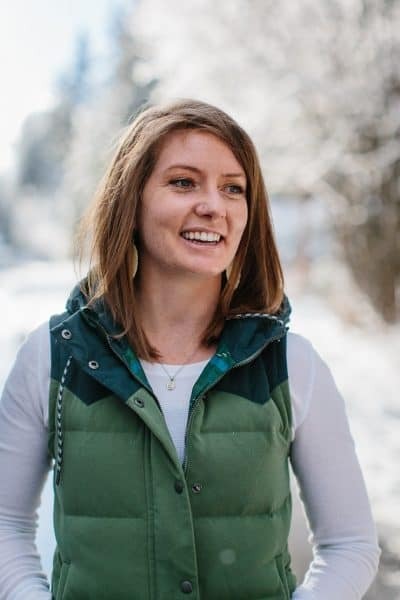 Georgia from The Comfort of Cooking is going to have a baby girl! In order to celebrate, myself and other bloggers are throwing her a virtual baby shower. We were all supposed to bring something pink to eat, but as always, I brought the green. And the pink. I counted the strawberry-mint vinaigrette and the strawberries as my pink contribution. Does this remind you of every board game you played as a child, where there was at least one kid who had to amend the rules because his/her brain couldn’t help but think outside the box? Real rule bender here. I’ll trade you one Starburst for Pennsylvania Avenue. But none of this shouldn’t come as a surprise considering I brought Broccoli Salad with Honey-Toasted Walnuts to Stephanie‘s baby shower. I may never be invited to shower again. In a small skillet, heat the balsamic vinegar and strawberries over medium-high heat and bring to a full boil. Allow mixture to boil and cook until strawberries are very soft, about 5 to 8 minutes. Mash the strawberries with a fork. Note: this will make your house smell like vinegar. But that's okay. Remove from heat, add the mint leaves, maple syrup, and salt and stir. Allow the mixture to cool slightly before transferring it to a cup or bowl and refrigerating until cool. Once cool, strain the strawberry pulp and mint leaves out of the mixture using a fine mesh strainer. Pour the mixture into a small blender, such as a Magic Bullet, along with the oil and blend until smooth (you can also whisk the strawberry vinegar and oil together by hand vigorously until combined). Set aside until ready to use. Add all of the ingredients for the salad except for the goat cheese to a large serving bowl. Toss in desired amount of dressing (you will not need all of the dressing). Serve salad with goat chevre. If serving this salad as an entre, it will feed 2 people. If serving it as a side salad, you can feed up to 4. I’m just now realizing that I didn’t bring pink either… Um, unless one lonely pink straw in the photo counts as my something pink. I totally went yellow with lemon. Looks like we’re the rebels of the group. Love this salad! Haha. Whatever happened to Hale Kale?! Loved that name! (totally kidding! I couldn’t help myself. :D) I’ve never found fresh kale but I got the frozen stuff and tried making a smoothie with it. A smoothie that made my tummy upset for days. Frozen kale and I aren’t friends. Strawberries totally count as pink! And I know Georgia will be thrilled to find salad at her shower. 🙂 Thanks so much for bringing a salad to the party! Pink or no pink, this is gorgeous and hey, that dressing is pretty pink if you ask me! This looks so refreshing and delicious. Happy baby shower to Georgia! Hey! I’m glad you bring the green!!!! This salad is all my favorites! I have never tried baby kale. I think I have to because I hate massaging kale! You are the queen of greens for baby showers and I love you for it. This looks like one giant plate of OMGYUMIWANTTHAT. i bought 2 big bags of kale this weekend and have been looking for ideas…these look gorgeous.. I have a bunch of mint growing out on my balcony– this would be a perfect way to use it up! I want that vinaigrette on everything this spring! Beauty! I want this right now! I wish I could eat this right now for lunch! Wine, cats, and kale are three of my favorite things, so it sounds like you had a pretty perfect weekend 🙂 I love the strawberries and goat cheese together, I could eat just those two ingredients with a fork, but the addition of avocado, almonds, and mint makes it over the top delicious! 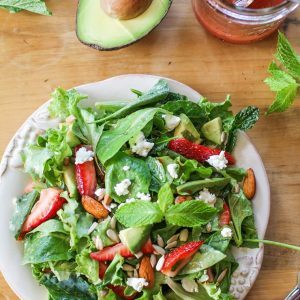 Love this strawberry mint vinaigrette! such a great color too! Love pink and green, totally preppy; and I’m loving this peppy, preppy little salad! Baby kale is my current favorite salad green and this dressing is the bomb! Kale and strawberry, yay! I like the combination, not only because it is amazingly colorful and colorful dishes make me happy, but above all because it create an intriguing mix of flavors. The dressing is really cool too! A lovely salad. And ohhh that vinaigrette. I can’t wait to try it. I love everything about this salad – it is beautiful! The dressing sounds amazing – can’t wait to try! I get so in to having my veggies that I forget sometimes to add fruit to my salad! This sounds so perfect for these spring days! I’m going to make that dressing just so I can drink it! Yum! I do enjoy baby kale for the same reasons; it’s just so much easier to use! Haha! You would certainly be welcome to my shower with this salad in hand! It looks amazing! I love a good kale salad with fresh fruit. And that vinaigrette sounds divine! 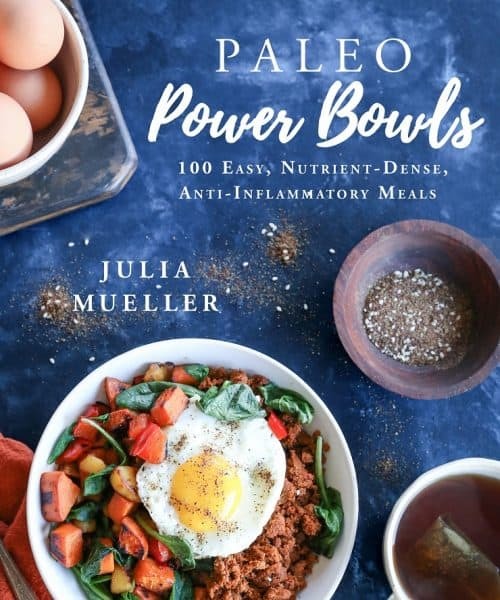 I’ll have to go check out your cookbook because you can never have enough kale…well, you caaaan but you know what I mean! So this is pretty much the prettiest kale salad that I ever did see! And that totally counts where the pink factor is concerned. I want to dunk my face in this and not come up until the bowl is clean. YAYYYYYY for beebies and uber yummy kale salads!! I seriously die over every salad you create. Da salad ka-weeeeeennn! Haha! I want to squeeze you right now! I happen to have all these things in my fridge right now!